SUN Movement Coordinator, Gerda Verburg with SUN FocalPoint for Uttar Pradesh, Amitabh Prakash, Director of the Nutrition Mission. On 24 May 2017, SUN Movement Coordinator, Ms Gerda Verburg, along with a delegation from the SUN Movement Secretariat, travelled to the Indian State of Uttar Pradesh to review progress and the path ahead for scaling up nutrition. Uttar Pradesh State joined the SUN Movement in 2016 with a letter of commitment from Chief Secretary, Alok Ranjan. Uttar Pradesh is the most populous state of India and recent surveys report that 50 percent of children under five years are stunted, 34 percent are underweight, and 10 percent are wasted. During the one-day visit, the delegation experienced first-hand the community-centred rally for improved maternal and child nutrition and health at an Anganwadi centre – which provides basic healthcare – coinciding on a Village Health Nutrition Day in the village Kaithy. These centres, of which there are 180,000 in Uttar Pradesh alone, undertake growth monitoring, execute supplementary nutrition programmes, in addition to counselling and health education sessions for mothers. Gerda Verburg, SUN Movement Coordinator during a visit to Uttar Pradesh. In a discussion with Mr. Amitabh Prakash, Director of the State Nutrition Mission and the SUN Government Focal Point for Uttar Pradesh, Ms. Verburg expressed her appreciation for plans to extend a holistic curriculum programme for all school grades on nutrition, sanitation and health. 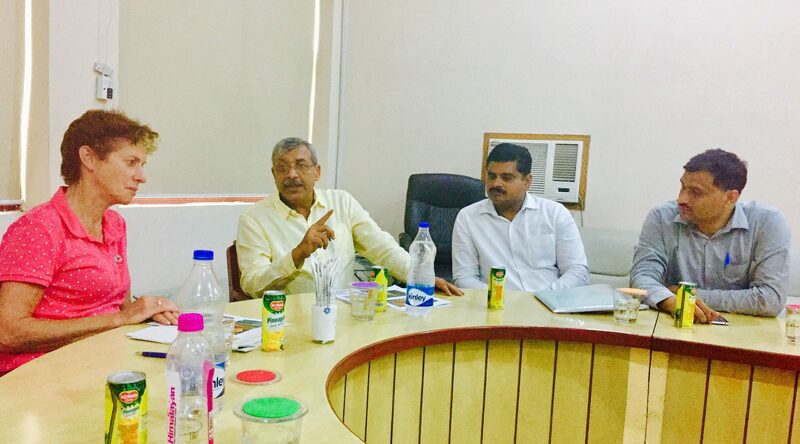 The delegation attended a District Nutrition Committee meeting in Unnao – home to more than 80,000 pregnant women and lactating mothers – which brought together various government leaders, concluding the visit with an insight into district level nutrition planning and implementation. This visit formed part of a mission across Indian States by the SUN Movement Coordinator and a delegation of the SUN Movement Secretariat. The mission coincided with the 2017 African Development Bank Annual Meeting in Gujarat and was followed by visits to Maharashtra, Uttar Pradesh and Delhi.